With my friend Lucien van den Abeelen, Secretary of the space flight magazine Spaceview, I visited the ship in January 1990. Our hosts were the captain Venyamin Kononov, Chief of the expedition Oleg Pavlenko and his deputy Aleksandr Lagodin. Without any reserves they answered our questions and showed us the laboratories and the antennae inside the huge domes. They told us the very interesting story about the KVK. In the period in which the Soviet Union still hoped to be the first to land on the Moon they urgently needed a ship for the tracking of the orbits of unmanned and manned satellites enroute to the Moon and back to Earth. In Leningrad the freighter Geniseysk was reconstructed in 6 months to become a tracking ship. To be able to work as quick as possible the engineers regularly adapted their designs. Even now it was visible that the work had been done in a great hurry: in the corridors to the laboratories were sheafs of cables with a diameter of 1 Meter. There had been not enough time to put away and cover the cables. Soon after the beginning of the operations of the KVK she was used for the Zond-satellites, which had to preceed the manned flights. But a short time after KVK became operational the Americans achieved their goal. The N-1 project was cancelled due to failed launches and the Soviet space flight program came in trouble. During the last Zond flights the KVK played an important role. Zond-6 and 7 had to be brought in a narrow trajectory after the retroburns before the ingress into the atmosphere. 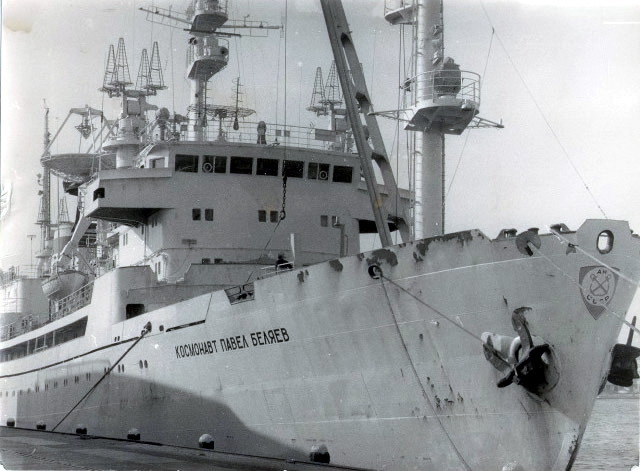 The command for the last retroburn was only possible from a ship in a position not far from Montevideo or Cuba. The KVK was chosen for that purpose and she gave the right commands. For those good performances the KVK was awarded with many important assignments such as the tracking of satellites for different purposes and objects in deep space. In this way KVK’s history entered a second stage. She assisted in many Soyuz flights, launches of Molniya’s, Salyuts, Progresses and MIR. For a long time they worked with equipment what was far out of date and though a lot of stuff already had been replaced by modern issues they still maintained the old means operational for nostalgic reasons. There was a direction finding installation which vertically had a surface of 3 by 4 Meters and still worked with valves. This installation was operational, but replaced by a much smaller apparatus. 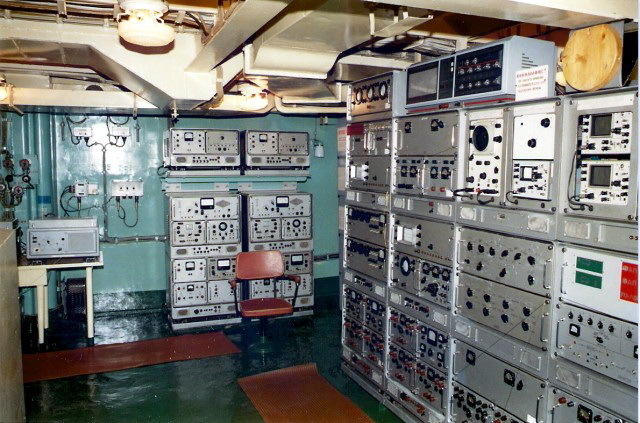 There even was a control device to aim antennae which still was used on board of a warship. The equipment for communications with cosmonauts during flights to the Moon was usable with high frequencies. Directly behind that equipment was a little cabin which had been in use until May 1989 during the last assignment near Gibraltar. When it was not possible to relay communications of MIR via Molniya’s KVK did this by her own. This cabin was not operational any more. There even was not a microphone. The reason was that in the near future this ship would be used for other assignments. So we could see the KVK with the installations needed during the first 2 phases and we met a lot of stuff which we knew from our radio practice. People in the area of the entrance to the port of Rotterdam were always surprised about the enormous antenna domes. 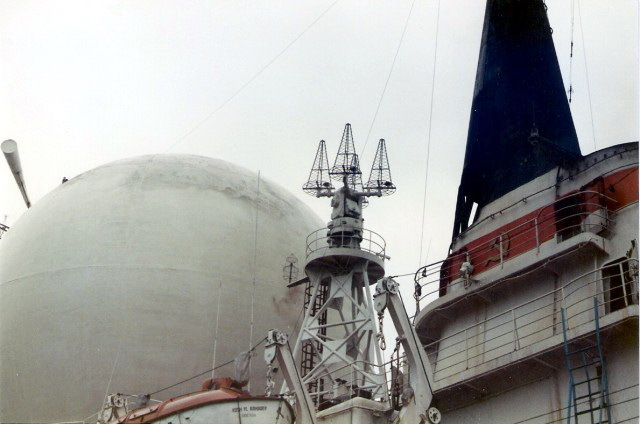 Every dome protected a big telecope antenna. For us it was a special sensation to be able to see the inside of one of these domes. KVK had 3 telescope antennae: 2 big ones and 1 small one. The big ones (one for transmission and one for reception) had been in use to track deep space objects, for instance satellites enroute to Mars, Venus and even farther. With the small antenna they executed precise measurements and soundings. Essentially for this was the continuous precision of the the aiming of the antennae. There was a system what by using gyroscopes and cardanic fixations took care that the ring from which the telescope was aimed remained horizontal in spite of the movements of the ship. Only when the swinging of the ship was more than 18.5 Meters the limits were exceeded. A gigantic counter-weight at the bottom could keep the forces within the limits. 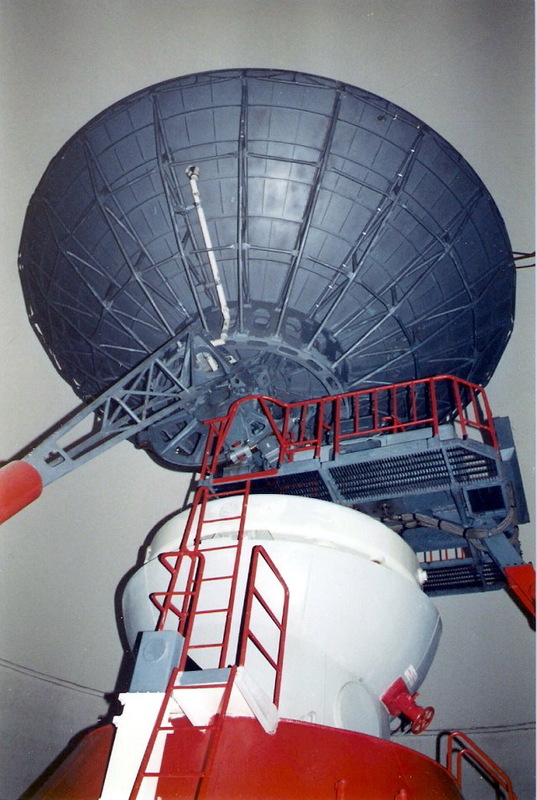 The node protecting the antennae was made by material giving only 1% energy loss for radiowaves. 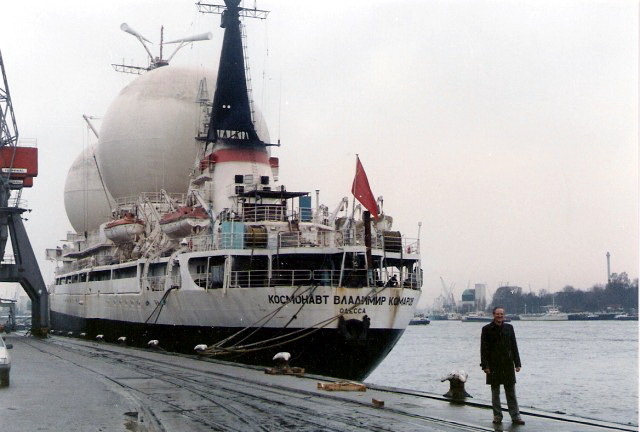 Some tracking ships, such as the Gagarin, Belyayev and Patsayev did not have such domes and that is why they always lost precision due to the windforces. Inside the domes every sound produced a long and loud echo. All what was said came back 3 or 4 times. An advantage was that the statements of the chief were repeated 3 times. The inside of the main laboratories were impressive. Everything was concentrated on exact radio activities. From a computer controlled device commands could be given to satellites. With a precise time measurement (always Moscow Wintertime, UTC + 3 hours) they could give commands. A switch board with function buttons like in our computers, but here with the whole alphabet and many numbers, enabled the selection of the commands. The most important commands were for the activation of steerings- and other rocketengines and the switching off and on of the systems of space flight objects, but also for launched rockets. 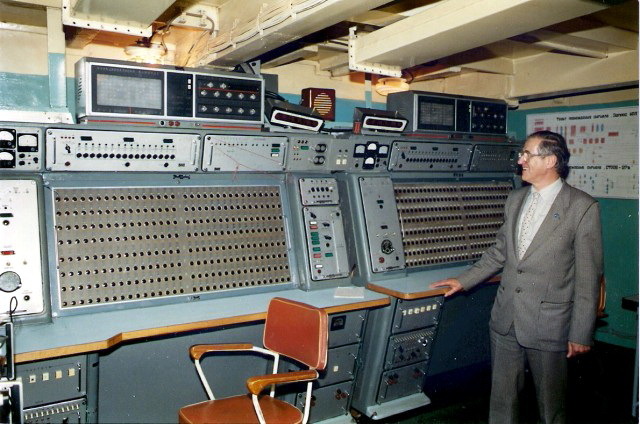 At the left side of the great command panel was the board for the reception and the confirmation (kvitantsiya) of the telemetry. The confirmation could be compared with our checksum and determined that the telemetry gave the right channels and data. The long conversation with the chief and his deputy did not give frequencies which were for us unknown until then. They only spoke about the bands, so never behind the comma’s. I got information about something what for years was a mystery. There was a system named Sapfir. Already during the flight of Romanenko in 1987 the cosmonauts spoke about this system and it was clear that it had something to do with communications. It was used to receive or transmit signals, for instance telemetry, television and voice. Romanenko said once that the voice of the man at TsUP sounded like captain Nemo. For a long time I had tried to detect what this was and one of the answers I got was that it was to transmit modulation with laserbeams. I did not believe this. Now I got an answer on my question: it was just a communication channel between 800 and 1000 Mcs, so somewhere in the 900 Mcs band. 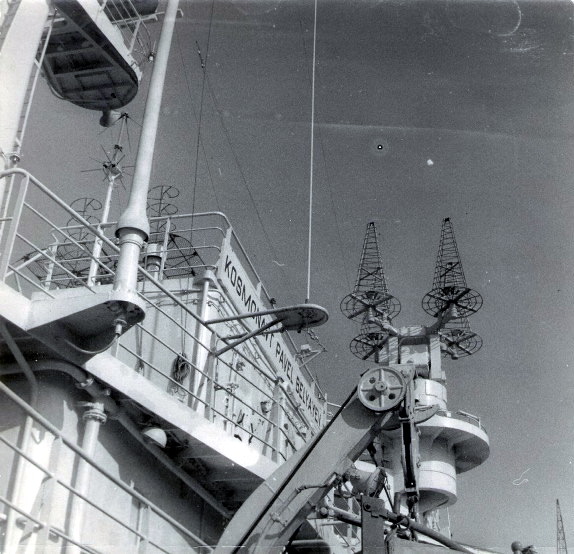 The helical antennae which always stood in groups of 4 and also could be aimed at satellites were for the 143 Mcs (MIR) or 142 Mcs (Salyuts). The fact that KVK was no longer in use for tracking of manned space ships I already explained in the paragraph of the Kosmonavt Georgiy Dobrovolskiy. With my friend Lucien van den Abeelen I visitied the ship in the port of Antwerp. 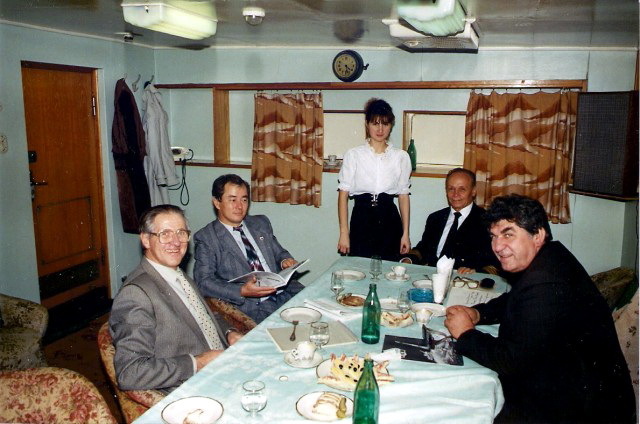 A few hours after the ship had moored we visited the ship to have a long interview with the chief of the expedition Nikolay Burov. We also had a short conversation with the captain Sivtsov. For a long time I monitored the conversations between MIR and KPB and that is why I could use this to arrange a visit to the ship and transport to Antwerp.This was the last opportunity to visit such a ship. KVP was enroute to Sankt Peterburg. KVP had to be relieved in the Atlantic, but the ship assigned for this mission did not show up and stayed in Sankt Peterburg due to financial problems. 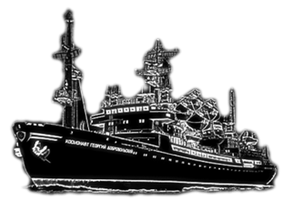 During the last half year the KPB was west of Africa where she assisted in MIR operations. On January the 14th the ship played a very important role during the almost fatal flight of Soyuz-TM17. Some collisions with Soyuz-TM17 caused an interruption in the communications via Altair ( Kosmos-2054) between MIR and TsUP. This caused consternation in Mission Control because there existed an uncertainty phase. KPB could be the first to communicate with MIR and S-TM17 and in that way shorten the awful phase by 10 minutes. Nikolay Burov was very proud when he told that. He also spoke with satisfaction about the tracking ship Kegostrov where he had been chief of the expedition. He extensively told us about the situation of the tracking fleet, his expectations, hopes a.s.o. after the collapse of the Soviet Union. Notwithstanding the economical problems of their country the hospitability for us was 100%. This visit concluded for me for ever the involvement with those ships and the radio communications in CW and Morsecode via shortwaves. Meanwhile I had experiences with the communications between MIR and TsUP via geostationary satellites. My friends Peter Jansen and Dieter Oslender were already able to receive that traffic and I translated and analysed this for them. This year, 1994, I got this facility with the help of those friends. This story I will describe in Paragraph 19.